Running releases more than just sweat. Is a Sub-2 Hour Marathon Possible? To win a race, you have to beat everybody else who shows up. But to set a World Record, you need to beat everyone who has ever shown up. EVER. 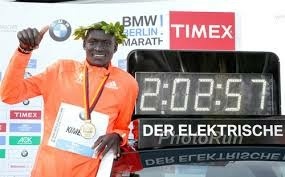 That is exactly what Ethiopian Dennis Kimetto did on Sunday in Berlin, smashing the previous world record set by Wilson Kipsang on the same course one year earlier – Kimetto ran an incredible 2:02:57, 26 seconds faster than Kipsang. 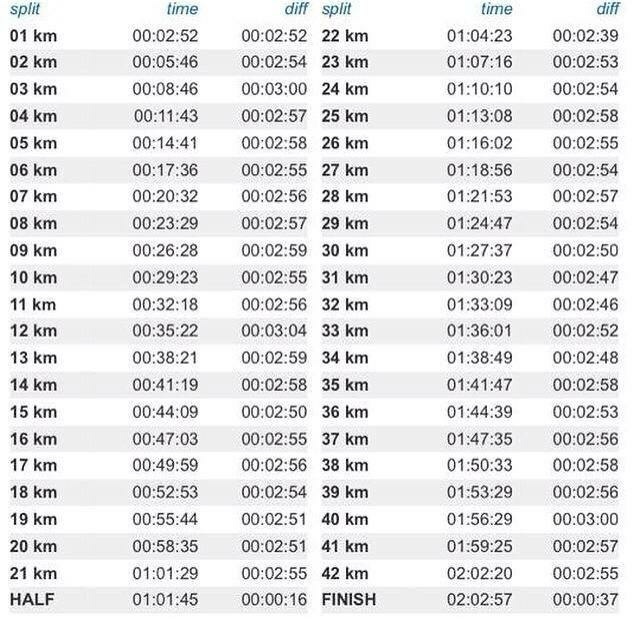 Take a look at his splits…. Kimetto’s World Record Breaking Splits. Second-placed runner Emmanuel Mutai was probably disappointed that Kimetto showed up, because he ran a 2:03:13, which is also faster than the previous World Record. This well and truly cements Berlin’s place as undoubtedly the fastest (IAAF approved) course in the world. The 7 fastest men in history over the marathon distance have all PB’d on the Berlin course. ← Can Viagra Make You a Better Athlete? Can Viagra Make You a Better Athlete? The Dolls Point Marathon 2016: You Don’t Have to be Fast, You Just Have to Be First.